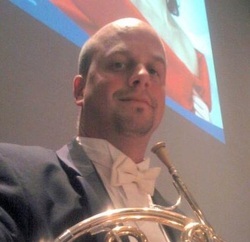 Florida native Tim Papenbrock is an active French horn player in the North Carolina Triad area. He is currently in his 24th season with the Winston Salem Symphony, as well as the Greensboro Symphony, where he has been 3rd horn since 2004. Tim also plays horn with the Winston Salem Symphony’s Brass Quintet, performing over 50 educational concerts with various ensembles throughout the year. Beginning in 2014, Tim has been 1st Alto Horn with the North Carolina Brass Band as well as joining the Piedmont Wind Symphony the following year. With North Carolina being a very active state in the arts, Tim also enjoys freelancing with the North Carolina Symphony and the Charlotte Symphony, as well as Opera Carolina other regional orchestras. Born in Jacksonville, Florida, Tim’s parents were both musicians with the Jacksonville Symphony. With his mom a violinist, and his father a cellist and conductor, Tim and his brother were quickly immersed in classical music. After his 2nd wonderful summer at the renowned Brevard Music Center in Brevard, North Carolina, Tim was accepted to North Carolina School of the Arts to finish out his junior and senior years of high School. He went on to attend college in Miami, Florida at New World School of the Arts, and at the University of North Carolina School of the Arts. ​After college, Tim dabbled briefly in musical theater, performing with the College Light Opera Company in West Falmouth, Massachusetts. He then went on to do a National Broadway tour, performing South Pacific over 140 times in 42 states. The birth of his two boys settled his musical travelings down, and he has been calling Winston Salem home ever since. He now resides with his wife, Erin, and their two girls, Abigail and Amelia.